How many times have you found yourself putting on your workout clothes first thing in the morning even though your workout isn’t until much later in the day. Or, you workout in the morning and somehow find yourself still wearing those same clothes at 6 pm. I know…I know… it’s easy and comfortable and somewhat nondescript so you don’t have to think about it or plan to change later. You can just get dressed and go. Plus, everyone is doing it these days so you don’t look out of place. But, at what cost? How does this affect your inner confidence and radiance? Does this photo fully reflect who Caryl is (her inner beauty words)? The ‘welcoming’ certainly fits and she is doing her best to reflect some of her other inner beauty words with her earrings, but the rest is lost in a sea of black. Of course, her uniform requires the simple basic black outfit, but as you can see your ‘wardrobe’ is comprised of more than the clothes you wear. As Caryl shares, “While I still wear basic black at work, I find a way to reflect my inner beauty words every day, a pair of sneakers with pizzazz, a cool pair of earrings or rings on all my fingers!” and, as you can see, she is now sporting a ‘passionately irreverent’ hairstyle that is with her no matter what else she is wearing. What does she do when she’s not at work? 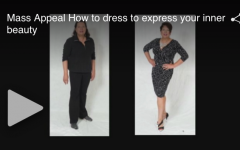 How do Caryl’s outfits reflect her inner beauty words? Passionately Irreverent – The passion comes in her interesting haircut and the deep, rich colors she wears. She adds the irreverence/sauciness by the way she partially tucks in the top, her asymmetrical haircut and the interesting back of the top. Optimistic – polka dots always add a quality of optimism or happiness – even when they are misbehaving a bit like in the purple/navy top! Spirited Elegance – No little jewelry for Caryl! She loves elegant jewelry that makes a statement. It does not have to be big and clunky but can have airy volume—as you can see in both outfits. While she could wear a simple pair of black pumps with the dress she prefers something that has an edge (spirited or irreverent) to it. And, the fit of her clothes (skimming her body) is very important and speaks to her natural elegance. Also, notice her terrific posture that speaks to her elegance (and what she does for work!) as well. Welcoming – even with all of her passion, irreverence, spirit and elegance there is nothing fussy or overbearing in her look. She has a welcoming spirit and smile! As you can see, reflecting who you are through the wardrobe and image choices you make is the way to create a wardrobe you love. What helped precipitate the change in Caryl’s personal style? 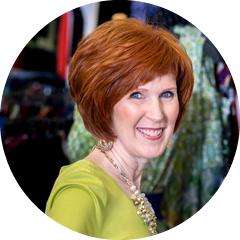 “I attended Ginger’s ‘Your Style, Your Way’ workshop and found myself again!” You can do the same and the workshop (www.yourstyleyourwayworkshop.com) is just one way to do it (the next one is January 23—see details below). A Note About the Clothes: All of Caryl’s after outfits are vegan/cruelty-free including the shoes, accessories and even the makeup. Please note that I am passionate about ending animal suffering and choosing cruelty-free clothing is just one aspect of a vegan lifestyle. If you have any questions about being vegan please let me know. I am happy to help and will answer any questions with kindness and compassion.